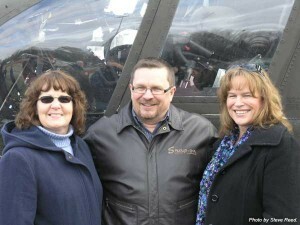 Jack Price Jr.and his wife Patty (left) with sister Dawn standing in front of the Chinook Helicopter last Friday. 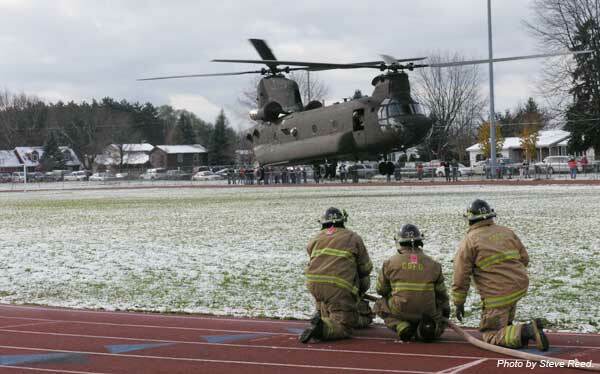 Hundreds of people turned out at Skinner Field last Friday, November 11, to see the landing of a Chinook helicopter for Veteran’s Day. It came about because a resident wanted to honor his younger brother—2nd Lt. Jack Price—a Cedar Springs man killed 42 years ago, at the age of 28, while taking a Chinook helicopter on a test flight in South Vietnam. Jack’s brother Wayne spent many hours researching what happened to his brother, and met several soldiers who served with him. One of those contacts led him to a Chinook instructor pilot, Timothy Miller, based at the Selfridge Army National Guard Base in Michigan. Through both the pilot’s efforts and City Manager Christine Burn’s request to the Pentagon, the Chinook helicopter landed at 11:00 a.m. at the field located adjacent to Morley Park in downtown Cedar Springs. On hand to greet the crew was Col. Tom Noreen, Cedar Springs Mayor Charlie Watson, Mayor Pro-tem Christine Fahl, City Councilor Ken Benham, and City Manager Christine Burns. Also on hand was the immediate and extended family of Jack Price, including Jack’s daughter, Dawn, and his son Jack Jr. with wife Patty. After the greeting, the public was allowed on the field to take tours of the helicopter and meet the crew, who along with the helicopter, will all be deployed to Afghanistan December 11. Wayne and his wife June were pleased with the way it turned out. “It was awesome, much better than I expected,” said Wayne. He said that many people thanked them for doing this for the Veterans. Other events that day included a special military display at the Cedar Springs Historical Museum, and a special ceremony at Veterans Park. The Cedar Springs Veteran’s Memorial Remembrance Committee coordinated all those events. The ceremony at Veterans Park included music by the Cedar Springs High School marching band, a vocal performance by D. and Nita White, a history of Armistice Day by Earl Tefft, commander of the Cedar Springs American Legion, a speech by Colonel Tom Noreen, the Kent County Honor Guard, Taps, and prayers by Pastors Mary Ivanov and Craig Owens. Pastor Craig Carter was master of ceremonies.